"Memory of the Land", wins the best experimental film at the second edition of Nazra Palestine short film Festival 2018, at Venice. Best experimental film at Siena and Especial Mention award "Oltre le Mura" Napoli. “Memory of the Land”, wins the best experimental film at the second edition of Nazra Palestine short film Festival 2018, at Venice. 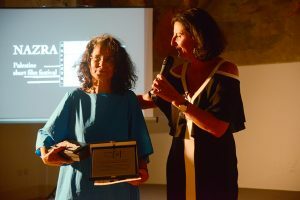 Best experimental film at Siena and Especial Mention award “Oltre le Mura”Napoli.